Through Train Windows was inspired by Norine Braun’s cross Canada Riding the Rails tour as Artist On Board with partner Alice Fraser last year. Travelling over 6000 kilometres from Vancouver to Toronto, Ottawa, Quebec City, Montreal and Halifax, Norine absorbed the ever changing vast and beautiful panoramas from the Rocky Mountains to endless prairie sunsets, boreal forests and the Atlantic ocean. With no wifi and time to reflect on nature and the paradoxes of life, Norine met and communed with the diversity of fellow sojourners from all over Canada and around the world. Following the tour, as a Musician in Residence at Banff Centre for the Arts and Creativity, Norine wrote most of these compelling songs in her studio facing Sleeping Buffalo Mountain. So climb aboard, sit back and close your eyes let the rhythm of the train soothe and inspire while conjuring up feelings of nostalgia and dreams. The multi talented and Juno nominated Adam Popowitz produced this album and also plays bass and lead guitar on the recordings. Adam produced Gone To The Spirits the album behind Norine's nomination for this year's Western Canadian Music Awards. Drummer Elliot Polsky returns as master percussionist, bluesmeister Huggybear Leonard on blues harp, Queen of the Trills Alice Fraser on elegant keys and saxophonist extraordinare Steve Hilliam who plays with such greats as Colin James and the R&B Allstars graces the album on 4 songs. “Supported by Creative BC and the Province of British Columbia”! 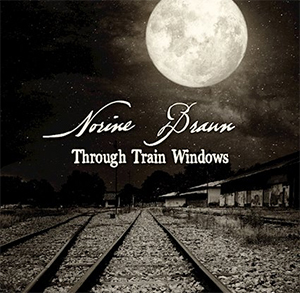 There is something for everyone on Norine Braun’s latest album Through Train Windows. Inspired by a cross Canada train journey, it is a diverse collection of musical vignettes that showcase the Vancouver artist’s vocal range and storytelling abilities. The album is as varied as the Canadian landscape. The opening track “Sleeping Buffalo” could be a lullaby sung while creeping around the foothills of the massive Rocky mountains, while the second track “I’m Going Home” suggests a triumphant return to the cosiness of a small town; perhaps nestled on the rugged shores of either coast or nestled in a little nook in the wild expanse of Manitoba. There are obvious jazz influences throughout the thirteen track collection, although Braun is clearly troubadour at heart. At its’ core, Through Train Windows is guided by a nomadic spirit with a strong emotional connection to place. No song conveys this sentiment better than “Heading up North”, with its simple arrangement and no-frills production. Braun’s voice is intriguing. It is beautifully suited to the vintage jazzy vibe that weaves its way around saxophone wails and some of the well-choreographed guitar solos. Its tone is rich and fluid and in the lower registers it finds a little bit of magic, especially with “Sleeping Buffalo,” the album opener and “Crosses and Sweetgrass”. The latter is a song that struggles with remorse and one wonders where on the journey this song found it’s way into a collection that is otherwise optimistically nostalgic. Whether by pavement or on rails, long has the road song been celebrated in folk and Americana. Inspired by Norine Braun’s actual ‘Riding the Rails’ tour as a designated ‘Artist on Board’ alongside partner Alice Frasier, Through Train Windows has plenty of them. Having journeyed over 6,000 kilometers from Vancouver to Ottawa, Montreal, and beyond, the Canadian singer-songwriter clearly had plenty picturesque to take in when getting down to crafting this homage to her adventures on-board. Reflective of the Rocky Mountains, chilly forests, vast prairies, and endless seas of Braun’s travels, the artist’s newest offering is as textured, varied, and vibrant as the melange of landscapes from whence it came. More-so than milquetoast, strummy folk, Braun’s Through Train Windows is an exercise in layered Americana, taking the best of what makes folk tick beside the blues to craft a convincing roots rock experience. Such ebullience is easy to ascertain from the opening moments of ‘Sleeping Buffalo’, Braun’s hearty vocals offering a forward soul to the song as it continues to unfurl a rich production. Truly indicative of the aforementioned prairies as well as the train on which she rode, Braun navigates the multifarious sounds swirling about her and communicates them in a way which conveys this atmosphere to her listeners. It’s not at all difficult to begin grasping the meticulous, heartfelt nature with which Braun approached developing this special release. Canadian singer-songwriter Norine Braun will drop her latest album December 7. Entitled Through Train Windows, the album was inspired by Braun’s cross Canada Riding the Rails tour as Artist On Board last year. From Vancouver to Toronto, Ottawa, Quebec City, Montreal, and Halifax, the tour covered more than 6,000 kilometers. When the tour ended, Braun composed the songs while serving as Musician in Residence at Banff Centre for the Arts and Creativity. With a sound blending blues, folk, soul, and roots rock, Through Train Windows features the talents of Braun (vocals, guitar), Adam Popowitz (lead guitar, bass), Elliot Polsky (drums, percussion), Huggybear Leonard (blues harp), Alice Fraser (keys, harmonies), and Steve Hilliam (tenor sax). Encompassing 13-tracks, the highlights on the album include “Sleeping Buffalo,” a delicious alt-rock number with bluesy country hues. Braun’s voice dazzles with its smooth, pristine textures. The harmonic scope and depth of this tune is remarkably resonant, and the wail of the harmonica is delectable. “Exhale” merges pop, rock, and blues into a radiant tune with a prog-rock-like feel. The rounded, topping tones of the bass line infuse the music with plumpness, as the compact snap of the snare accompanies a shushing high-hat. Layered sonic textures shimmer with nuanced colors, as Braun’s rich voice soars overhead. “Heading Up North” rides a steady acoustic guitar while an electric guitar echoes in the background. Braun’s delightfully velvety tones hold the song together, preventing it from becoming a trippy psychedelic song. “Rock The Rolling” features a fusion jazz-flavored tune, with almost hip-hop-like spoken word lyrics mixed with melodic vocals. “Crosses & Sweetgrass” might be my favorite song on the album because of the gorgeous resonance of the piano and Braun’s passionate, evocative tones. It’s a distinctive, marvelous voice, with graceful inflection and magnetic charm. Through Train Windows is an excellent album, well-worth your attention and time. As will become evident as you listen to the album, the captivation of the softer, creamier songs is more beguiling, subjectively, than the more potent rockers. Vancouver singer-songwriter Norine Braun is back with a new album Through Train Windows, a follow up to 2017’s wonderful Kind of Blues. Aptly titled, Through Train Windows was inspired by a recent tour in which Braun traveled across Canada via railway, and there’s a deeply personal identity to the majority of the songs as the artist soaked in the towns, landscapes, and people she encountered on her travels. Braun’s lyrical style is fantastically poetic, calling to mind the likes of Bob Dylan and Joni Mitchell, but stylistically she never shies away of exhibiting a harder blues rock edge when necessary.